Posted on Sat, Feb 18, 2012 : 5:59 a.m. The University of Michigan will likely almost always be known as a "football school." But on Saturday, for at least one afternoon and evening, the Michigan basketball program will take center stage in both Ann Arbor and across the country. The 17th-ranked Wolverines (19-7, 9-4 Big Ten) will look to keep their Big Ten title hopes alive when No. 6 Ohio State (20-4, 10-3 Big Ten) visits the Crisler Center (9 p.m., ESPN). The game will mark the first time the Michigan plays host to ESPN's "College Basketball GameDay," bringing more national exposure to John Beilein's surging program. "They do eight (GameDay programs), maybe, a year," Beilein said Friday. "And for us to be one of those eight (is special). "To have it here and to have it be a day-long commercial for the University of Michigan (is great)." Michigan's Tim Hardaway Jr., left, battles Minnesota's Elliot Eliason for a rebound earlier this season. Hardaway's effectiveness on the glass against Ohio State will be crucial. There's really no way Michigan is going to be able to completely take away Ohio State's advantage on the glass. Nature and gravity says so. The Buckeyes dominate Michigan in the tale of the tape, and no matter what the Wolverines do with their lineup, they won't be able to match Ohio State's size. Still, this thing can't be a tip drill. In Columbus, that's exactly what happened. And the biggest reason for the 37-22 Buckeye advantage on the boards was sophomore wing Lenzelle Smith Jr.
Smith put up 17 points and grabbed 12 rebounds, eight of them on the offensive end. Virtually all of his points came via putbacks, and most of those were on the weakside glass. And, more often than not, he was beating Tim Hardaway Jr. to the hoop. Hardaway has insisted he spent the past few weeks working on the little parts of his game. Now is his chance to prove it. If Hardaway can be assertive on the defensive glass, and shore up the weakside, Michigan should be able to curb some of Ohio State's massive size advantage in the paint. Michigan isn't likely going to win the rebounding battle, but it can't be embarrassed. And Hardaway has a lot to do with that. What's expected: Appearances by Beilein and the entire Michigan basketball team, a special feature on senior captains Zack Novak and Stu Douglass and a special bit with Michigan football quarterback Denard Robinson. How to get in: Student season-ticket holders may line up outside the Crisler Center at 5 a.m., and gates will open at 7:30 a.m. The event is free. Michigan really hasn't shown much 1-3-1 zone defense this season, and when it has, the sets haven't been overly impressive. Even so, it's an incredibly awkward defense to prepare for, and perhaps no one in the country is better at implementing it than Beilein. On top of that, one way to curb Ohio State's girth edge is zoning Jared Sullinger and forcing Aaron Craft, William Buford and Deshaun Thomas to find a way to solve it on the perimeter. Going zone forces Ohio State to find another way to work inside to Sullinger, and it takes pressure off Michigan forward Jordan Morgan. Morgan fought Sullinger hard in Columbus, but it's tough to see him being able to go toe-to-toe for 40 minutes against him without ending up in foul trouble. The Wolverines don't need to live in a zone all night, but aggressively mixing in and out of 1-3-1 and 2-3 sets may be beneficial. Trey Burke wasn't bad against Ohio State in a 15-point loss on Jan. 29, but he wasn't great either. He finished with 13 points and five assists, but also had five turnovers, and struggled to fight through the physical defense of Craft and Ohio State's aggressive cover of Michigan's high ball screen. Ohio State entered with a strong gameplan: Keep Burke out of the lane, and render Michigan punchless. For the most part, that's exactly what happened, and the Wolverines shot just 35.8 percent on their way to scoring just 49 points. If Burke can't create space for himself, Michigan is going to have to do it for him. Meaning shooters like Stu Douglass and Zack Novak are going to have to knock down shots (Novak didn't score against OSU the first time). Morgan is going to have to finish hard on the pick and roll, and Hardaway has to be a driver. Burke's at his best when the Wolverines are moving, and not standing around watching him dribble. In Columbus, there was too much standing and watching, and Burke had no room. In Ann Arbor, if everyone gets involved early, Burke may find those creases easier. Michigan senior captain Zack Novak will be playing his second-to-last regular season game at the Crisler Center on Saturday. Novak said it best Friday. "These are the games that you sign up for when you come to Michigan," he said. "You want to play Ohio State, you want it to be the main game on TV and you want it to have some meaning as far as your season goes. Michigan gets a national audience, a shot to rejoin the thick of the Big Ten race, a chance for revenge against an arch-rival and an opportunity to prove wrong anyone who doubts that the program is officially back. Not back as in "NCAA Tournament hopeful," but back as in "Big Ten title contender." Michigan has to play with emotion, it has to feed off the crowd and it has to take advantage of the moment. When there's a chance to run, you take it. If a shot's open, you make it. 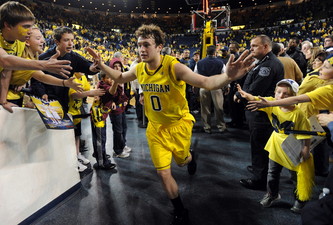 For two hours Saturday night, the sporting world will focus in on the Crisler Center. There is no football game to compete with, and no other national college game is on the menu. If Michigan craves national respect and wants to prove it's "back," it has its chance. Now all the Wolverines have to do is cash in on it. Sat, Feb 18, 2012 : 2:42 p.m. It should be an exciting day for you guys! Although I am sorry that tomorrow will be hard to wake up to another loss to THE OSU! Just kidding guys... relax and good luck! Sat, Feb 18, 2012 : 3:33 p.m. Sat, Feb 18, 2012 : 3:24 p.m.
Kinda like how you felt the morning after MSU beat you? Sat, Feb 18, 2012 : 2:37 p.m. The basic premise that Michigan is known as a Football School is grossly in error, a percept not even considered by fans of Michigan athletics with any knowledge of its rich history. I have only ever heard this from outsiders, and never, ever, prior to 2005. It is hideously inaccurate. Sat, Feb 18, 2012 : 2 p.m. This is BIG for UM! This opportunity for the national stage hasn't come around much for the basketball program in decades. It's an opportunity to show off the renovated Crisler Center and the new PDC to top national recruits. Yes, we all know that Michigan is a world-class institution, but recruits usually don't spend much time frequenting the museums, the Law school, medical research facilities, engineering or any of the other academic units on campus. So, getting something other than the Big House on the national stage is huge. Oh yeah, a win will be nice. Sat, Feb 18, 2012 : 1:35 p.m.
dont make this game bigger than it needs to be. Just beat ohio. the rest of this stuff is media hype.